With Native & Search, you can perform bulk uploads from AdWords Editor account files. 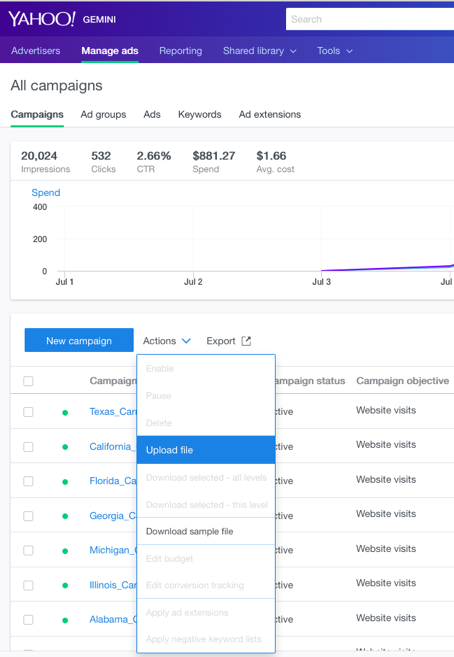 That means, if you’ve already created campaigns in other online advertising programs, like Google Ads, you can import them into Native & Search, without having to reproduce them manually. The Ads Import/Editor tool is designed to save you the time and effort if you had to recreate your account manually. Once your campaign is uploaded, you can make changes to fine-tune your campaigns based on your advertising goals. To take advantage of the tool, you can simply download a full or partial account file from the Ads Editor and upload it into Native & Search. 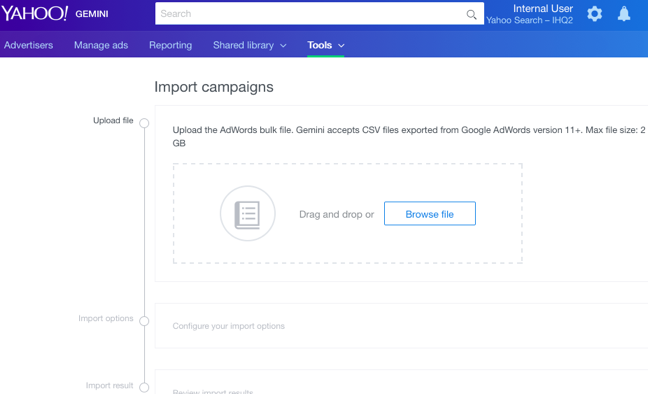 You select Tools > Import from Ads to import your Google Ads Editor account file. 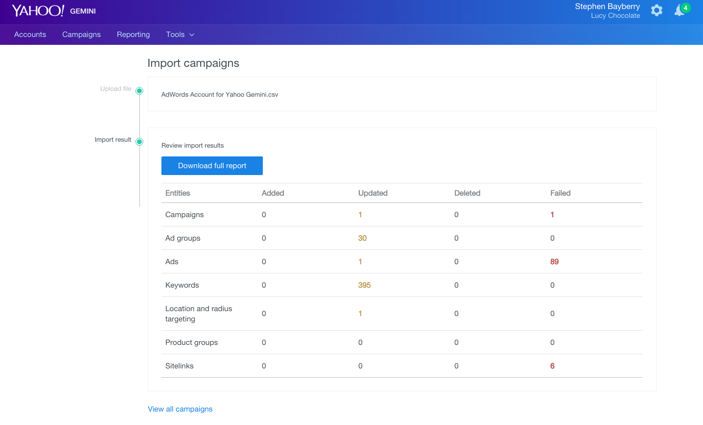 Now follow these steps to import your campaign data. And then review your import results. Or you can upload your Google Ads account using the bulk file upload option. If you’re new to Native & Search, you can create your new account by importing your existing Ads campaigns. Simply select Actions next to the New campaign button and click Upload a file from the dropdown menu. Native & Search provides support for Ads imports up to 2GB for an uncompressed file and 300MB for a compressed file. Because of differences and variations in products, not all the information will be imported. Make sure that you review your campaigns and results file, so that they’re set appropriately. Check language targeting, keyword libraries, ad extensions, network distribution settings and experimental traffic settings. Keep in mind that only negative keywords are supported at the campaign level (positive keywords are not supported or ingested). Product Listing ads are available only to advertisers with a Yahoo Account Manager. Product Listing Ads updates are supported via Upload from AdWords. Before importing your Product Listing bulk updates, be sure to create a Merchant Center account, establishing your data feed and initial Product Listing structure. To create your product listing ads, you must first create a Merchant Center Account. Contact your account manager for help on setup. Once your Merchant Center is established, use either the Native & Search bulk upload or Upload from AdWords to add and update your Products bulk structure. File size limits: unzipped is 1GB limit. Zipped is 50MB.